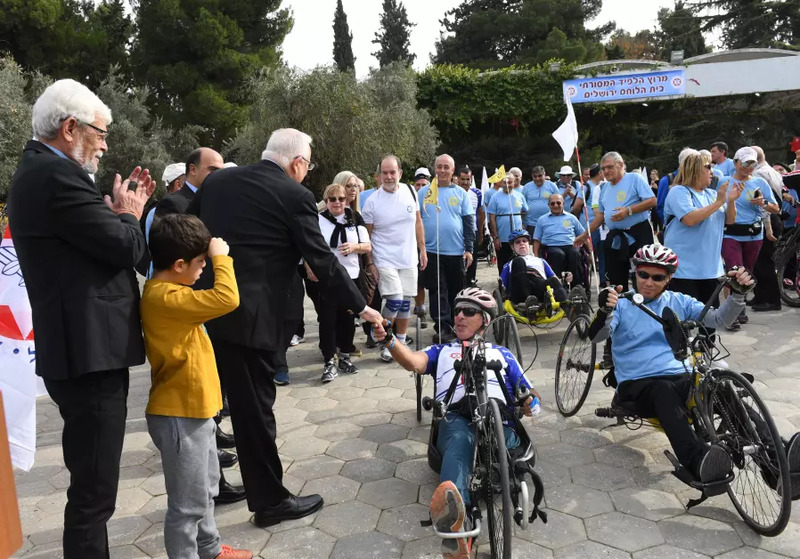 Home/About/News and Media/Main/President Reuven Rivlin meets disabled veteran cyclists in Jerusalem. Rivlin is a great believer in education by example, and tries to include his grandchildren in as many events as possible that are linked to Jewish tradition, to patriotism, to sport and to courage. Yet another instance of this manifested itself on Wednesday when holding one of his grandsons by the hand he came into the compound of the President’s Residence where a large group of disabled soldiers from Beit Halochem Jerusalem and Beit Halochem Haifa – rehab and sports centers for injured and/ or disabled soldiers – were waiting to start their annual Hanukka torch race from the President’s Residence to the capital’s Beit Halochem. The veterans arrived early in order to get into formation, with the relatively able-bodied men and women in the back, and those using recumbent handcycles, hand-propelled scooters and wheelchairs in front. There were also a few men with bicycles. Rivlin meets with disabled soldiers several times a year in different parts of the country. The president spoke of shared history and a shared yearning to live in the homeland. Rivlin said that the legacy that the veterans establish, carry and pass on to the next generation is no less important. It is essential for combatants to transfer the legacy to the generations that come after them, he said. Injured war veterans know from deep inside what the younger generation will have to endure, said Rivlin. They know how to tell of the depths to which a soldier can sink but also know from personal experience to relate the way in which to rise out of those depths, to continue coping and to know that it possible to have a productive life. The journey from the President’s Residence to Beit Halochem is not an easy one, said Rivlin. It is a test of courage and physical stamina, but it is also symbolic. Haim Bar, chairman of the Disabled Veterans Association, said that the race is an expression of determination, struggle and willpower.